Easter is 11 days away, but I'm already planning my menu. It's actually easy because my family expects the same thing -- ham, macaroni and cheese, deviled eggs, homemade rolls and fruit tea -- every year. The menu might get boring, except I change things up by preparing different side dishes. A few years ago, I discovered I loved cranberries paired with oranges. I think the cranberry/orange combination is especially delicious served with ham. 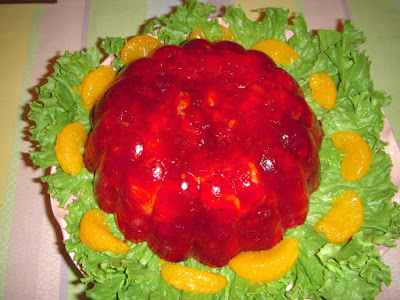 Last Easter, I served a cranberry/orange side dish in the form of Cranberry Orange Relish. This sweet-tart relish is a combination of fresh cranberries, apple, orange, pineapple and sugar. If you don't have fresh cranberries on hand, you can still enjoy a cranberry/orange side dish. Cranberry Orange Casserole uses canned whole berry cranberry sauce and mandarin oranges mixed with lemon juice and sugar. Unlike the relish, the casserole is heated in the oven and served hot. The recipe only makes four servings, but it can easily be doubled or tripled. If you want to serve a cold side dish, try Southern Cranberry Salad. It also uses whole berry cranberry sauce and mandarin oranges, but is combined with cherry gelatin, water and pineapple for a congealed salad. If you prefer a seasonal side dish, check back soon for a recipe that uses the quintessential spring vegetable. Preheat the oven to 350°. Combine the ingredients and pour into a greased casserole dish. Bake 25 minutes until hot and bubbly.